A scant two months before Eugenio Zampighi’s birth on 17 October 1859, his hometown of Modena declared itself to be part of the newly united Kingdom of Italy. It was a moment when Italy was reclaiming its cultural identity and forging a modern nation out of the numerous duchies, kingdoms and foreign-dominated governments that had controlled the area in the wake of the Napoleonic Wars. As the Risorgimento, or resurgence movement, grew in strength, a group of artists in the city of Florence took an increasingly active political role. In fact, they were among the primary instigators of the influential demonstration on 27 April 1859 that paved the road for Tuscany to join the unification movement, thus setting a standard for blending social change, Italian cultural identity, and aesthetic innovation. By 1870, Italy was a united nation, governed by a constitutional monarchy with an elected parliament in Rome. It was in this remarkable and influential historical moment that Zampighi began his art studies. He first entered the Modena Academy in 1873 at the surprisingly young age of thirteen. Like so many northern Italian communities, Modena’s cultural sophistication had its roots in the medieval university established there in 1175; shortly after the Academy was founded in 1683, it underlined this scholarly inheritance by re-naming itself the Regia Accademia di Scienze, Lettere ed Arti (Royal Academy of Sciences, Letters and Arts). Zampighi’s admission to the prestigious fine arts school associated with the Academy meant that he received a classical education, with an emphasis on the art of ancient Rome as well as the Renaissance. Five years later, he passed all of his examinations with first class medals, and perhaps more importantly, received a three-year scholarship to study in Rome. In 1883, Zampighi chose to spend the last year of his scholarship in Florence, where the revolutionary Macchiaioli group had been based since the 1860s. Although Zampighi’s interests lay in genre painting rather than landscapes, he shared the Macchiaioli goals of portraying the lives of common people. Like the Realists in France, the Macchiaioli hoped to convey a sense of immediacy about the conditions of working people as well as the poor. However, their cause was uniquely Italian, emphasizing what has been described as italianità—the visual expression of the essence of Italian culture from a personal, and specifically Italian, perspective rather than that of a foreign visitor or tourist. [i] This search for a cultural and national identity in the visual arts was inseparable from Risorgimento ideals, and although little is known of Zampighi’s political views, there can be no doubt that he supported the ‘resurgence’ of Italian leadership in the arts. After a year of study in Florence, deeply influenced by the Renaissance heritage as well as the contemporary Macchiaioli, Zampighi decided to settle there in 1884. It was at this time that he began devoting his efforts to the depiction of ordinary—but specifically Italian—people. His subject matter ranged from domestic interiors to leisure activities and family gatherings. Almost without exception, these modestly sized paintings appealed to a middle-class art market, and were sold primarily through art dealers in Florence, who often commissioned his work. Zampighi’s painting was equally successful with American and British collectors, probably because of the large expatriate communities living in Florence at the time. During his Florentine years, Zampighi also created a large painting for the Academy of Modena. Based on a poem by Giacomo Leopardi, one of Italy’s most respected nineteenth century writers, the image was resoundingly popular, and ultimately earned Zampighi the honorific degree of “professore” from the Academy. More typical, however, were paintings like A New Friend, which depicts a young mother holding her baby while an older man—the grandfather perhaps—presents the child with a toy monkey. 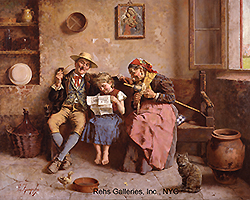 The scene itself is not especially remarkable, but the figures demand the viewer’s attention because they seem so totally engaged in the moment, as if a camera had simply captured a candid family scene. 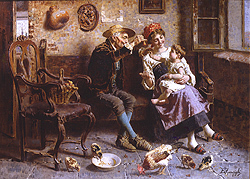 Part of this immediacy stems from the use of “macchia,” or splotches, of light and dark used to create the figural forms, but it is Zampighi’s respect for his subject that transforms this work from a clever genre painting into a more durable record of a memorable interaction among family members. Similarly, in a painting such as The Latest News, Zampighi presents an amusing scene of two monks trading gossip over cappuccino, but he simultaneously maintains respectful of their humanity. They do not become caricatures. During the early twentieth century, Zampighi continued his successful, and financially rewarding, practice in Florence. The advent of World War I may have been the catalyst for him to return to Modena, although there is no documentation of the date. At that time, he may also have taken on some teaching responsibilities at the Academy there. By the 1920s, Italian modernists had indeed triumphed over the sometimes burdensome legacy of Italian art history, but leadership in the visual arts had not yet returned to Italy. Ironically, Zampighi was witness to the beginning of a different kind of design leadership in his own hometown where Ferrari, Lamborghini and Maserati were creating the finest of the new automobiles. By the beginning of World War II, he was living in Maranello, a Modena suburb. Then in his 80s, Zampighi had lived through a transformative and revolutionary period in both politics and art. He died in 1944 at the age of 85. [i] Albert Boime, The Art of the Macchia and the Risorgimento, Representing Culture and Nationalism in Nineteenth-Century Italy, (Chicago: University of Chicago Press, 1993). 94.